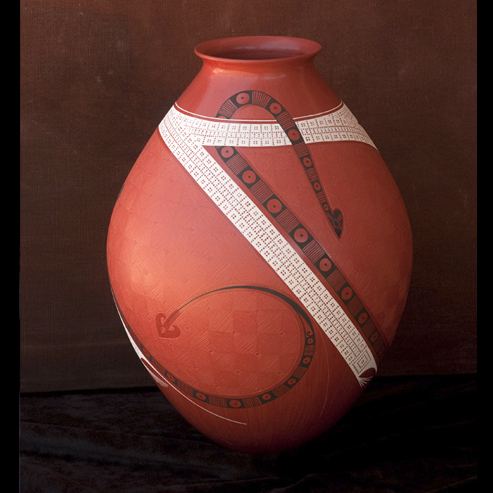 I’ve been passionate about Mata Ortiz pottery for a long time. My first visit to Casas Grandes and Mata Ortiz was actually spurred by my fascination with the shamanic effigy pots – smoking pots – excavated from the ruins of Pacquime, another story altogether. But my first visit to the area ultimately brought me to Mata Ortiz, where I met Juan Quezada and two of his sons. In those days there was still no road to the village and the ride, about 20 miles from Nuevo Casas Grandes, was more than an hour of bone-rattling abuse on a donkey trail; we almost didn’t make it through a few arroyos, as the rainy season has arrived. Walking the sun-drenched streets of Mata Ortiz was a surreal experience as doors would open slightly and people would softly call-out, ‘Ollas, hay ollas. Quieres ollas?’ Like walking on another planet and being courted by drug dealers every step of the sway, selling something called ollas. Perhaps the piece that resonated most vividly with me that day was a pot by a guy named Manuel Rodriguez. That memory is poignant, and pleasing, in that today, 12 years later, I go to Manuel ‘Manolo’ Rodriguez’s regularly. He has become a dear friend and is one of Diego Valles’s very closest friends. Indeed, Manolo is the Godfather of Regina, Diego’s oldest daughter. In turn, Diego has become one of my very closest friends. It is a pleasantly small world at times. When I began to come to Casas Grandes and Mata Ortiz regularly, I became friends with Spencer MacCallum, who is arguably the reason the Mata Ortiz pottery phenomenon even occurred, and he was keen to introduce me to three potters: Diego Valles, Manuel Rodriguez and Martin Cota. And, so introductions were made, and I began to immerse myself into the community of potters whose work continues to take my breath away. Along the way, I met Hector Gallegos (Jr.) and his wife Laura Bugarini, and another destination was added to my list of regular visits. Then I met Cesar Navarrete, an extraordinary artist and all-around wild man, a kindred spirit. Then Eli, Cesar’s brother, with whom I now play music and supply with the occasional guitar or amp; these dear friends, now a family of choice, with whom I have cast my lot, as much as I can, four times a year, as I do after all live in Minneapolis. Diego, Manuel and Hector are among the very best of the artists in Mata Ortiz, now just beginning its fourth generation of potters. They are among the new master potters of the village. Diego has lead the vanguard of contemporary design; he is the first to have cut holes – huge, visually moving gestural holes – into his sometimes enormous pots. He is highly educated and widely read; he eschewed an electrical engineering degree to stay with and push his pottery. It was a wise decision, as last year saw him receive the Premier Young Visual Artist (under 30) of Mexico, 2010, receiving this amazing honor from Presidente Felipe Calderon, at the Capitol in Mexico City. He is now a National Living Treasure of Mexico. Diego’s brushwork in unrivaled. Mind you, he (like Manolo and Hector) dug his own clay, processed his clay, made his own slips, made his own brushes from a child’s hair, and then, had the temerity to fire his extraordinary work in his back yard, under a galvanized bucket, with cottonwood bark or cow chips. Go figure. Hector simply does the finest sgraffito on the planet. IÕm serious, he does. In recently shooting images of his work, I was continually stunned by close examination of his work. Of course, IÕve seen and owned his work for years, but like truly good art, it never wears out, it never ceases to amaze. Manolo is the wild-card in the bunch. He is a truly great and humble man, but he is a complete goof-ball. It is had to have real serious conversation with him, because you’ll always find yourself joking and laughing with him. But, his work is fantastic and you never see the same thing from him. He starts on a pot and decorates from a stream of consciousness unique to Manolo; he doesn’t draw or sketch on his pot, like everyone else. His complex tessalations speak to Escher influences, just as you might wonder where his mind’s eye comes up with his effigy figures. His fish pots are highly sought-after and world-famous. And, foremost in my life is my studio work with clay. I work for NCECA and I teach at Concordia University, but my itch can only be scratched by working with clay. I have felt such an affinity with Diego, Hector and Manolo because I share so many visual and aesthetic sensibilities with them. My work can be quite intricate, and like HectorÕs, is narrative. Like Manolo, I donÕt have too many serious bones in my body. And, like Diego, I have an insistent urge to create and push visual movement and gesture. As well, with Diego and Manolo, I share some common decorative marks, particularly entoptics.